A parliamentary report of 1777 recorded three parish workhouses in operation in Guildford — Holy Trinity (for up to 20 inmates), St Mary (24), and St Nicholas (20). 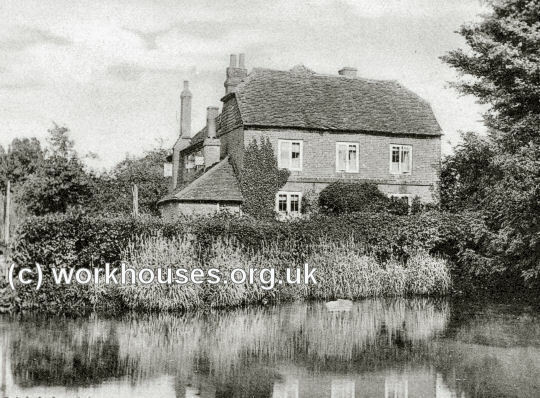 There were also parish workhouses at Albury (18), West Clandon (4), Godalming (76), Purbright [Pirbright] (30), Send and Ripley (4), Shiere [Shere] (40), Wisley (8), and Wokeing [Woking] (40). In 1656, the old Cloth Hall on North Street in Guildford, which dates from 1629, was converted to house paupers. Albury's parish workhouse was built in 1732 on Park Road at Albury Heath. 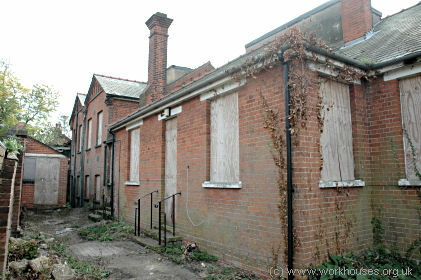 Albury former parish workhouse, 2005. Shere had a "parish house" — a 17th century cottage known as "Allens" — which was in trust for the use of the poor between 1697 and 1802. In the early 1720s, a workhouse was erected at Peaslake (then known as Pislick Bottom). In 1728, parish records mention the purchase of 2,000 bricks to be delivered to the workhouse by Mr Chitty at a cost of 25s. Tiles were also bought at 15s. per thousand. Governors of the workhouse include John Ellyott, who received £1.4s. for three months service in 1778, and Mrs Pellate, received only 12s. a quarter. In 1794, the parish burial register records the name of Susan Honey who was noted as having spent forty years in the workhouse. In 1784, the running of the Shere workhouse was contracted out under a system known as "farming the poor". Thomas Hornsby was paid around 2s.6d. per week for maintaining each of the inmates who numbered between twelve and twenty. The experiment appears not to have been successful as the following years, Mrs Pellate resumed as governor. However, a new contractor, James Gadd, was employed from 1786 to 1789 and paid 2s.3d. per head per week. The farming system continued, with a succession on contractors being employed. In the early 1800s, the numbers in the house rose steadily and reached a very overcrowded peak of 44 in 1819. Conditions in the Shere workhouse were generally comfortable. An 1836 inventory includes "stump" bedsteads (i.e. no headboards), feather beds, flock mattresses, sheets, rugs, bolsters, oak chests, "earthen chambers". A large 15 foot dining-table was used for communal meals which were eaten off wooden trenchers with spoons. The workhouse also had its own bakehouse and brewhouse. 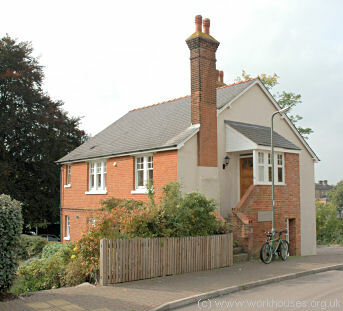 West Horsley established a workshouse at the east side of The Street, in a property now known as the Old House. 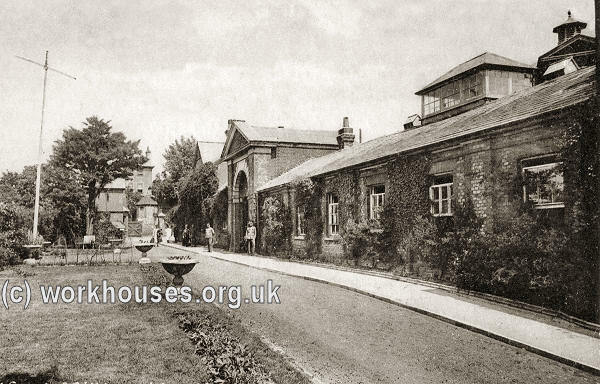 West Horsley former parish workhouse, early 1900s. County of Surrey: Albury, Artington, East Clandon, West Clandon, Compton, Guildford St Nicholas, Guildford St Mary (2), Godalming (3), Guildford Holy Trinity (2), East Horsley, West Horsley, Merrow, Ockham, Purbright, Send and Ripley, Shere, Stoke, Wanborrow [Wanborough], Worplesdon, Wisley, Woking (2). Later additions: Bowling Green (1858-1883), Guildford Christchurch (1904-8), Guildford The Friary (1858-1908). The population falling within the Union in 1831 had been 22,147 — ranging from Wanborough (111) to Godalming (4,527). The average expenditure on poor relief for 1832-4 had been £18,680 or 16s.10d. per head of the population. 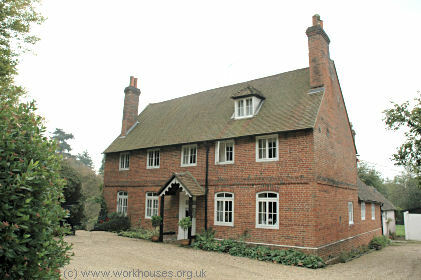 A new Guildford Union workhouse was erected in 1836. The Poor Law Commissioners authorised an expenditure of £5,075 on construction of the building which was to accommodate up to 300 inmates. It was designed by George Gilbert Scott and William Bonython Moffatt who were the architects of many other workhouses at this period, including a nearby one at Windsor. Guildford is typical of their style, and similar to their designs for Unions such as Tavistock. Guildford school and original casuals' block from the east, 2005. An interesting insight into the life of the workhouse comes through this job advertisement for a nurse in 1880. The hospital was enlarged in 1870. In 1893, a pavilion-plan infirmary was added at the east of the workhouse, together with an infectious diseases block, a married couples block to the south of the workhouse, and a large casuals' ward on Union Lane. A mortuary and disinfector were designed in 1895. A new dining-hall, kitchen and laundry were erected in 1899, and a nurses' home in 1909. A surviving part of the married couples block has been incorporated into a modern redevelopment of the site. Guildford married couples block from the north-east, 2005. A new entrance lodge was erected at the north-west of the site on Union Lane. A master's house was built at the north of the school block. The extended buildings are shown on the 1914 map below. 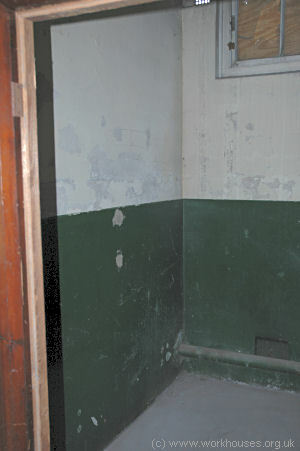 The 1893 casual ward, designed by Edward Lunn, was a typical cell-based layout of its period. It comprised a male section at the east, female section at the west, and an entrance at the centre on Union Lane (now Warren Road). Small children could accompany their mothers in the female sleeping cells which were wider than those on the male side. Guildford casual ward from the north-west, 2005. 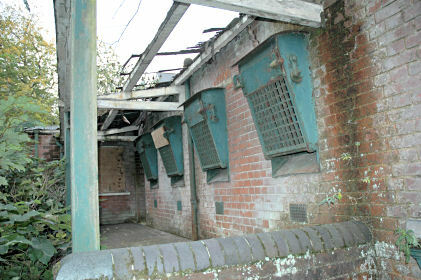 Guildford casual ward entrance yard, 2005. The writer George Orwell visited several casual wards in and around London in the late 1920s, recording his experiences in an essay called The Spike, and later re-used in Down and Out in Paris and London . The proceedings were presided over by a fearsome 'Tramp Major', probably a former tramp himself, now employed by the workhouse. On admission, casuals' own clothes were taken off them for disinfection and they were given temporary workhouse clothes. All new admissions were required to take a bath — the bathroom contained two bathtubs whose water was changed fairly infrequently. A medical inspection was also required. 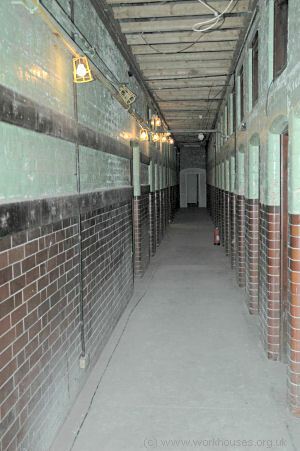 The male section of the ward contained eighteen sleeping cells at its southern side and four sleeping/stone-breaking cells at the northern side. 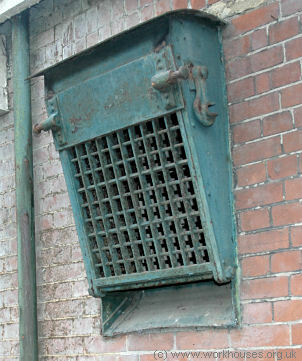 The usual practice was for vagrants to spend two nights at the workhouse, and on the day in-between, a certain weight of stone had to be broken up into pieces small enough to pass through a metal grid in the wall of the cell. 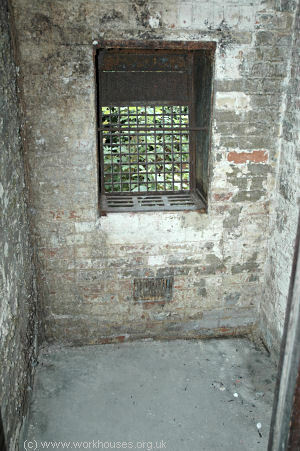 The grid could be lowered from the outside to allow lumps of unbroken stone to be placed in the cell. Guildford casual ward stone breaking grid, 2005. "You have got a nice bit of garden here?" "Yes, it is pretty good." "And are those your pigs in the sty there?" "And there is a horse and cart, is that yours, too?" " Oh yes, that is what I goes to market with. And who be you, Sir?" "Well, I am the new relieving officer, and I think you had better come up and see the Guardians next board day." Needless to say, the invitation to meet the Guardians was not accepted. The pauper, who had been for some ten years in receipt of parish relief, was thereafter able to maintain himself without assistance front the rates. On another occasion the same officer found a man who had been twenty years in receipt of relief (originally given on account of some bodily infirmity), and who eked out his parish allowance by keeping a mangle, to work which he employed two grown women. A hint to present himself at the Board had the immediate effect of severing the long connexion between the parish and this enterprising pauper. 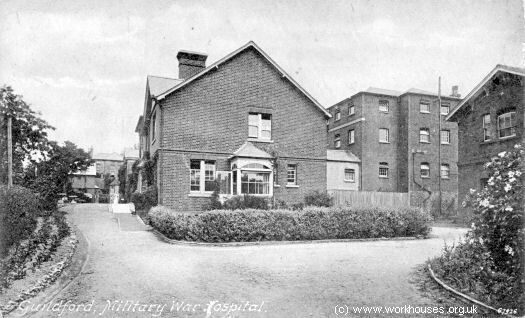 During the First World War, the workhouse was employed as a military hospital as shown in the view below which dates from around 1916. 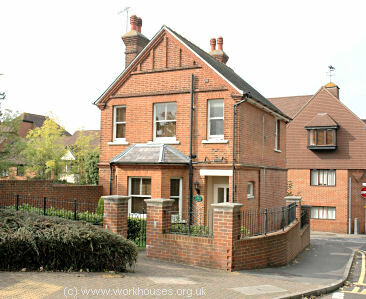 After 1930, the workhouse became a Public Assistance Institution under the name St Luke's Home. 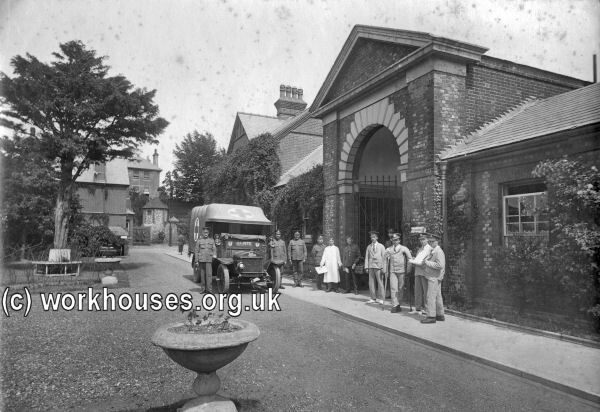 The workhouse infirmary was taken over by Surrey County Council in 1930 and became Warren Road Hospital. In 1945, it became St Luke's Hospital, and in 1948 became part of the newly created National Health Service. 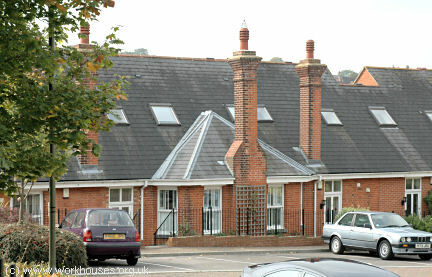 The former workhouse and infirmary buildings have been demolished and housing now occupies the site. The casual ward is a very rare survivor of its type. The building has now been listed and a large part restored to its original appearance, now housing a workhouse museum. By the early 1900s, the Guildford Union had established a number of children's scattered homes in Guildford. In 1908, these comprised: Elsinore, 14 Springfield Road (13 boys); Branksome, 48 & 68a Woodbridge Road (12 girls); Restormel, 36 Recreation Road (12 boys); Newark, 37 Recreation Road (12 boys); Providence, Artillery Road (11 girls); Irvindale, 1 Cooper Road (12 girls); and River View, Woodbridge Road. Surrey History Centre, 130 Goldsworth Road, Woking, Surrey GU21 6ND. Holdings include: Guardians' minutes (1836-1930); Births (1866-1936); Deaths (1887-1914); etc. Davies, PM (1983) The Old Royal Surrey County Hospital 1866-1983. 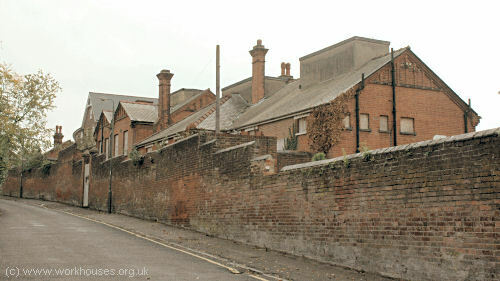 Davies, Helen C (2004) The Guildford Union Workhouse and the Vagrants' Casual Ward "The Spike" (Guildford Museum). The Spike at the Guildford Union Workhouse: the Vagrants' Casual Ward , Surrey Archaeological Society, Bulletin 337, April 2000.